The system was introduced in 1982 in Europe, and was first used in the USA by Mobil in 1986. Paul Luthra, who had graduated at the top of his class at National Institute of Technology, Kashmir with subsequent graduate degrees from XLRI- Xavier School of Management and the William E. Simon Graduate School of Business Administration, was working for Ponderosa Steakhouse and Bonanza Steakhouse in Dayton, Ohio as a Senior Systems Analyst. On a rainy day in 1978, his manager and mentor Bill Fessler (a graduate of Miami University) stopped at a gas station. Paul watched Bill from the car and noticed the two trips to the cashier hut. At that moment, with the mind-set of a time and motion engineer, Paul saw that an application of ATM technology at the pumps would make it convenient and quicker to buy gas. Banks had recently adopted the ATM technology. He shared his thoughts with Bill. Subsequently Bill Fessler changed jobs and joined Mobil, got funded to the tune of $3 million for research and development and got the system implemented. The system allows customers the convenience of not having to walk far from their vehicle, wait in line, or wait for the human station attendant to process the transaction. It also provides the attendants the advantage of being able to tend to other duties rather than being busy with customers. Only 13 percent of convenience stores had the technology by 1994, but 80 percent of U.S. convenience stores used the technology by 2002, and virtually all stores do today. In 2004, Sheetz was the first to use touch-screen kiosks by the pump where customers can also order in-store foodservice items that they pick up after fueling. In 2012 Zarco USA was the first to have ordering touch screens on the pump. It is seen as a way to keep the cost of gasoline down by reducing the need for employees at filling stations. 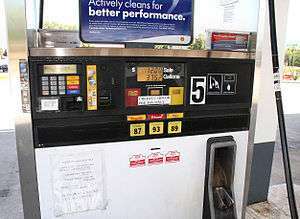 It is considered to be a major change from the days in which full service was the norm at filling stations, and the attendant not only pumped fuel, but also washed the windshield, and checked the fluids and tire pressure, all while the customer remained in the vehicle (full service is legally mandated in the U.S. states of New Jersey and Oregon). Those who use the pay at the pump feature could be putting themselves at risk for fraud, as thieves attach skimmers to the pumps that can steal the information off the cards used to make purchases. Many debit cards can be used to make the purchase either as debit or credit. But those who make the purchases as debit are feeding their information into the skimmers. Without the human interaction, there is no verification system when credit cards are used to make purchases, and no signature is required. This enables those in possession of stolen or cloned credit cards, or those who are otherwise making unauthorized use of another's card to purchase gasoline without a signature. Many stations now require customers making credit-based transactions to enter their zip code (United States) or equivalent (other countries) in order to be allowed to make a fuel purchase. The receipts issued by the pumps, if not taken by the customer, often bear the number of the credit card used to make the purchase. If found later by a thief, this could be used to commit fraud against the customer. Laws in some places prohibit the full credit card number from being displayed on the receipt. Some stations will place a temporary block on a certain amount of money in a customer's account following the use of a debit card to make a non-PIN-based purchase, since it takes about three business days to have the accurate amount debited. This could be as little as $1 or as much as $128. While this amount is placed on hold, the customer could be penalized for non-sufficient funds when making other purchases on the same account. Stations are guaranteed to receive up to this $75 on fuel purchases, even if the purchase was made fraudulently and the card-holder is not held liable. As gas prices have risen during the 2000s, many fill-ups are costing customers more than $75, the maximum amount that can be authorized from a single swipe. Credit card companies have considered raising this limit to accommodate larger purchases. The pay at the pump feature has led fewer customers to enter the area of filling stations that sell other items typically sold at convenience stores, thereby hurting the profits stations make from such sales. This is seen as an advantage to the customer not just for saving money, but also by reducing clutter and mess in the vehicle. The feature is also criticized for causing the loss of some jobs. While stations continue to have an attendant on duty, the customers are performing many of the former tasks of the attendant, thereby leading to less availability of employment. Some filling stations are totally unattended and only allow customers to purchase fuel by paying at the pump. ↑ "Paul Luthra (paul.luthra@gmail.com) - LinkedIn". www.linkedin.com. Retrieved 2016-03-24. ↑ Douglas F. Aldrich (6 October 1999). Mastering the Digital Marketplace: Practical Strategies for Competitiveness in the New Economy. John Wiley & Sons. pp. 38–. ISBN 978-0-471-34546-6. ↑ Brookings Institution (1 July 1997). Brookings Papers on Economic Activity 1997. Brookings Institution Press. pp. 319–. ISBN 978-0-8157-0578-9. ↑ "Convenience Store News". Convenience Store News. Retrieved 2016-03-24. ↑ Hamermesh, Daniel S. (2004-01-01). Economics is Everywhere. McGraw-Hill/Irwin. ISBN 9780072851434. ↑ Markham, Jerry W. (2002-01-01). A Financial History of the United States: From Christopher Columbus to the Robber Barons (1492-1900). M.E. Sharpe. ISBN 9780765607300. ↑ "Debit card 101: Choosing 'credit' still risky". msnbc.com. Retrieved 2016-03-24. ↑ Staff, C. S. D. "Cutting Credit Card Fees for Convenience Store Retailers". Convenience Store Decisions. Retrieved 2016-03-24. ↑ Marion, Kathryn A. (1995-04-01). Success in the "Real World": The Graduate's Complete Guide to Making the Most of Your Career (& Your Life)!. Education for Reality, Incorporated. ISBN 9780964539150. ↑ "Stock quotes, financial tools, news and analysis - MSN Money". articles.moneycentral.msn.com. Retrieved 2016-03-24. ↑ "Credit Card Fraud Protection Stops Gas From Flowing at the Pump | Fox News". Fox News. 2007-06-17. Retrieved 2016-03-24. ↑ "At the Pump And Past The Limit". www.washingtonpost.com. Retrieved 2016-03-24. ↑ Baird, Lori (2002-08-24). Cut the Clutter and Stow the Stuff: The Q.U.I.C.K. Way to Bring Lasting Order to Household Chaos. Rodale. ISBN 9781579545123. ↑ McGlowan, Angela (2009-08-17). Bamboozled: How Americans are being Exploited by the Lies of the Liberal Agenda. Thomas Nelson Inc. ISBN 9781418567682. ↑ Cohen, Steven (2006-01-01). Understanding Environmental Policy. Columbia University Press. ISBN 9780231135375. ↑ Hinckley, James; Hinckley, Jim; Robinson, Jon G. (2005-01-01). The Big Book of Car Culture: The Armchair Guide to Automotive Americana. Motorbooks. ISBN 9780760319659.